The town of Cheltenham is a real jewel in the Cotswold crown. Cheltenham is on the edge of the Cotswolds and has an image of being respectable and wealthy. The small River Chelt flows under and through the town. Cheltenham is the home of the flagship race of British steeplechase horse racing, the Gold Cup, the main event of the Cheltenham Festival held every March. The town hosts several festivals of culture. The town was awarded a market charter in 1226, though little remains of its pre-spa history. Cheltenham has been a health and holiday spa town resort since the discovery of mineral springs there in 1716. 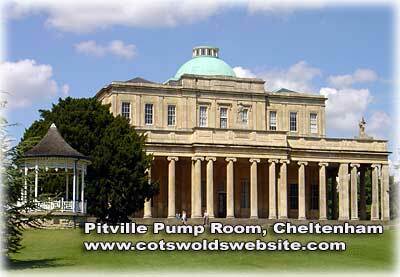 The spa waters continue to be taken recreationally at Pittville Pump Room, built for this purpose and completed in 1830. Cheltenham's success as a spa town is reflected in the railway station, which is still called Cheltenham Spa, and spa facilities in other towns that were inspired by or named after it. On 1 April 1974, under the Local Government Act 1972, the borough of Cheltenham was merged with Charlton Kings urban district to form the non-metropolitan district of Cheltenham. Four parishes — Swindon Village, Up Hatherley, Leckhampton and Prestbury — were added to the borough of Cheltenham from the borough of Tewkesbury in 1991. If you are looking for accommodation in Cheltenham, try the Cheltenham web site.